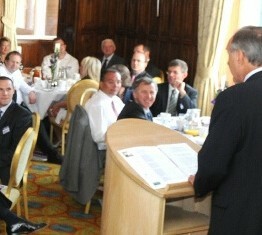 Audience: 120 – with leaders from top 100 companies in East Anglia. As his script indicates – John’s association with many of the world’s leading companies over many years has given him a unique overview into what makes successful organisations tick. His ability to research and craft an entertaining yet thought-provoking speech means there are few business topics he is unable to speak about. Call now to discuss how John can help make your next event memorable!